Most people who are familiar with the Sembawang area, would remember the Karimun Admiralty Country Club, which had a driving range among other club facilities. This country club, which was closed down in 2007, was housed in an important building, the Old Admiralty House (gazetted as a national monument on 2nd December 2002), which was used by the British for strategic planning during World War II. Situated atop a hill, aptly named the Admiral Hill, the historic building overlooked the Sembawang area as well as the old Sembawang Wet Market and Food Centre. This building also has a little-known rear entrance from Sembawang Road (covered later in this article) which had attracted my attention several times when I drove past the area previously. Interesting Fact: The Sembawang area got it's name from the Kayea Ferruginea tree, also known locally as the Sembawang Tree. Another prominent place named after a tree would be Changi. The massive Changi Tree used to tower above the canopy of trees in Changi, only to be removed later by the British during the second World War, to prevent the advancing Japanese forces in using it as a marker. Spending a large part of my childhood living in the north, I could vividly remember that my parents used to bring me to this food centre, which was located at the junction of Canberra Road and Sembawang Road. Being able to see cockles, fishes, frogs and other live seafood displayed in front of the stalls was kind of an adventure for little me. The food centre was made up of 2 buildings, one which housed the market and the other, the famous hawker centre. This hawker centre came alive every evening, providing hungry patrons with a wide array of tasty treats, skillfully whipped up by the numerous stall-owners. Satay, Hainanese Western and Mee Goreng Mamak were but a few of the various local dishes on offer. The vibrant energy, sights and smells were a thing of a past, but one of which I would never forget. My personal favourite was the western food from this stall called Michael Kim's Western Food, presumably named after its owner. The stall was relocated to the old Sembawang Shopping Centre and, subsequently disappeared after the mall was refurbished into the swanky new mall you see today. It is rather sad that the good old things, especially the food stalls we have all grown to love, have to go in the name of progress. Sadly, the Market / Food Centre was closed down in the mid-Nineties, presumably to give way to new developments. The market was demolished and an empty field stands in it's place now. Part of the new Sembawang HDB Estate, which was later erected along Canberra Road, faces the empty field. But I digress. The Old Admiralty House, which was designed by renowed British architect Sir Edwin Lutyens, was built in 1939 and is an example of late Victorian architecture, with its unique asymmetric design. It wasn't just used for military intelligence, it was also the residence of the Flag Officer of Malaya (a high-ranking Naval officer) when the British were in charge and was also called Canberra House at one point in time. Ownership of the building changed hands several times, with it being renamed to Nelson House, Admiralty House and Anzuk House, after the ANZUK forces (Australia New Zealand United Kingdom Forces), which were deployed to protect Singapore. From 1958 to 1971, it also served as the residence of the British Commander-in-Chief, Far East Station. Upon the departure of the British Forces in Singapore in 1975, It was then handed over to Sembawang Shipyard and converted to a recreational club, and later to the management of the Karimun Admiralty Country Club in 2001. Noticing that there was some children laughing from within the building compounds, I found out from the security guards that there were some swimming classes going on at the moment, which will conclude in early 2011, when the SLA regains full control over the premises. They then solemnly told me not to enter any of the buildings, (or to take any photos of these buildings), which included the pool area, as they fell under SLA's control now. However, after explaining that I was taking photos and documenting my visit for historical reference and citing our team's origins and objectives, they relented on their stand and agreed to tell me more. Changing their tone, the security guards informed me that the Country Club evacuated the building slightly over 2 months ago and some of the other tenants followed suit. They also told me that there is a cafe near the pool, as well as a Chinese restaurant near the entrance, which were still in operation. Apparently, the rest of the compound was abandoned. I turned around from the guardpost and found this to be true when I realised that an empty void stood in place of the Admiral Bar & Grill, a place which I so often visited not so long ago for their wonderful grilled sausages, cheap beer and impressive karaoke system. After a little persuasion, they relented on their stand and allowed me to take a few photos of the surrounding areas, as long as I didn't take any photos of the buildings. With the blessings of the security (as long as I did not step over the line! ), I proceeded with my walkabout, snapping away with my phone camera as I treaded carefully around the premises. I decided to start off by making my way towards the main gate. Looking at the two stone walls that flanked the entrance, I glanced towards the right, focusing on the barren open field against the backdrop of several HDB flats. Who would have believed that this field, now overrun with weeds and potholes, was once part of the driving range. A row of green poles， running along the perimeter of the field, stood steadfast in the strong gusts that were blowing in my direction, remnants of what was once a popular haunt for avid golfers practicing their swings. If not for the potholes, occasional shrub and long grass (potentially a snake haven), I'm pretty sure the residents nearby would have used this field for kite-flying, a popular pastime in the fields of nearby Woodlands. Walking past the empty carpark, I headed for the Dutch Ship replica situated behind the guardpost. The ship was erected after the latest tenants took over. Its reddish paint was weathered and the windows were stained with algae. However, the golden propeller located behind the ship was still shiny and gleaming in the sunlight. Moving towards the right side of the compound, I entered a garden of sorts. There were potted plants arranged in straight lines on either side of the paved track, leading to a dead end. 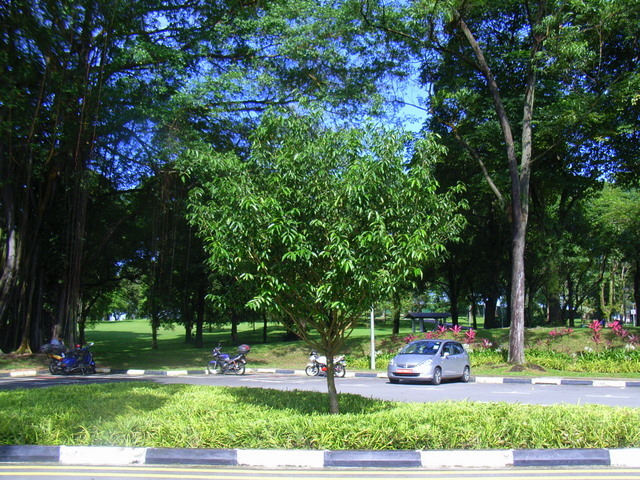 The HDB flats along Canberra Road could be seen beyond the canopy of trees at the end of the track. Avoiding the bees flying around a pot of red flowers, I made my way towards the abandoned basketball courts. As I arrived at the perimeter fence which ran around the hard court area, I noticed the children getting louder. Snapping a photo of the empty basketball court by sticking my phone camera between a hole in the wired fence, I noticed two areas of interest to my left and right. To my left was an empty building which looked like a staff quarters (for the former grounds staff?) while there was a single story structure which looked like some sort of stable to my right. Was these part of the grounds used to keep ponies, for pony rides or riding lessons? That is a plausible conclusion. Moving to the front facade of the (supposed) quarters, I noticed two stone lions guarding a staircase leading into the quarters. This reminded me of the two stone lions that stand firmly outside the SAF DB (Detention Barracks). Note: There is an urban legend about the stone lions of the DB. It is said that if you look at either lion in the eye, you would be sentenced to serve time in the DB after that. When I was still in the SAF as an MT Specialist, I went to fetch one of my drivers , who had just been released from DB. When told about this urban legend, he defiantly stared into both lions' eyes and laughed it off. 2 months later, he was sent to DB again for going AWOL. I felt that this was purely a coincidence, of course, but it sure was a good story to share. Walking past the quarters, I could see the backdoor of the cafe, and the whirring exhaust fan and pungent smell of stale oil suggested that the cafe was still patronised by many hungry children after their swimming class. Before long, I came back to the guardpost, where I started my round. Short of covering the actual building itself, I had covered almost every part of the surrounding grounds. It was a real pity that I wasn't able to snap any photos of the historical monument itself but I do respect the authorities' decision. With most of the walking around the compound done, I made my way to the rear gate of the former country club. While the building's entrance itself is located on Old Nelson Road, the rear gate was facing Sembawang Road. There is a flight of stairs that is visible from Sembawang Road. If you follow the stairs up, you will arrive at the rear gate. Pieces of old newspapers strewn all over, as well as a couple of half melted candles suggest that people have been here, while overgrown grass, lots of dead leaves and tree branches show that the stairs have not been used for a really long time. Well, it was a rather fruitful trip, save for the part where photography was prohibited for the main buildings and the areas enclosed within the building itself. Would we return for another trip when all the tenants move out? An Urbex trip into a historical monument, with traces of the former country club which once inhabited its grounds? That sure sounds like a swell idea. Maybe, just maybe. Ending on that note, we are pretty glad that the building will be preserved for many more years to come. It is good to see the authorities breathing new life into these monumental structures. We await with bated breath to see what will the Old Admiralty House be used for next.